The public's knowledge of the Woburn problem stems solely from the residents' actions in discovering the leukemia cluster and pursuing the subsequent investigations. In researching this book, we read countless articles in newspapers, popular magazines, scientific journals, and health publications and followed television and radio coverage of the Woburn events. Uniformly, reporters and commentators view the Woburn citizens as the most powerful instance to date of a lay epidemiological approach to toxic wastes and disease. Although one of us (Phil Brown) some time ago coined the term "popular epidemiology" to describe Love Canal residents' organizing efforts, Woburn actually furnishes the first example of popular epidemiology strong enough to allow for the detailed formulation of the concept. Traditional epidemiology studies the distribution of a disease or a physiological condition and the factors that influence this distribution. Those data are used to explain the causation of the condition and to point toward preventive public health and clinical practices. 1 In contrast, popular epidemiology is the process by which laypersons gather scientific data and other information and direct and marshal the knowledge and resources of experts to understand the epidemiology of disease. In some respects, popular epidemiology parallels scientific epidemiology, although they may proceed in different forms and tempos. In some cases, such as the discovery of Lyme Disease in the early 1980s, laypersons solved an epidemiological mystery before trained scientists. Despite similarities to traditional epidemiology, however, popular epidemiology is more than a matter of public participation in traditional epidemiology. Popular epidemiology goes further in emphasizing social structural factors as part of the causative chain of disease, in involving social movements, in utilizing political and judicial remedies, and in challenging basic assumptions of traditional epidemiology, risk assessment, and public health regulation. Still, the starting point for popular epidemiology is the search for rates and causes of disease. We shall restrict the label of adherent or practitioner of popular epidemiology to residents who develop and apply the work of popular epidemiology in their communities. Sympathetic scientists may become supporters of popular epidemiology, but lay involvement in the discovery and pursuit of disease in such cases as Woburn is so significant that we shall apply the term only to laypersons. Adherents believe strongly that science, like government, must serve the needs of the people. Just as they question the political apparatus that typically discourages lay investigations into toxic hazards, so do they question the detached attitude of many in the scientific community who champion supposedly value-neutral scientific methods. Although our discussion of popular epidemiology focuses on toxic waste contamination, the approach is valid for many other phenomena such as nuclear plants, pesticide spraying, and occupational disease. Popular epidemiology is an extremely significant advance for both public health and popular democratic participation. In Woburn, residents were the first to notice the leukemia cluster, through both formal and informal methods of identification. Then they framed a hypothesis linking pollution to disease and pressed local, state, and federal agencies to investigate the cluster. They particularly asked authorities to test the water that they suspected of being a cause. After state environmental officials found high concentrations of TCE and PCE in wells G and H, residents argued that those known carcinogens were the cause of the cluster. To bolster their hypothesis, Woburn residents joined with biostatisticians from the Harvard SPH to carry out the community health survey. Without community involvement, this study would not have been possible because of the lack of money and personnel. The very fact of lay involvement led professionals and government to charge bias. Nevertheless, extensive analyses by the researchers demonstrated that the data were not biased, especially with regard to the use of community volunteers as interviewers. Resistance to the idea of lay participation is harmful, since professional and governmental distrust of the public can delay amelioration and cause additional disease and death. Popular epidemiology opposes the widely held belief that epidemiology is a value-neutral scientific enterprise that can be conducted in a sociopolitical vacuum. It also challenges the belief that epidemiological work is properly conducted only by experts. Critics of the Harvard/FACE Woburn health study—among them the CDC, the American Cancer Society, the EPA, and even the SPH's Department of Epidemiology—argued that the study was biased by the use of volunteer interviewers and by prior political goals. The possibility of volunteer bias is a real concern, but on a deeper level the criticisms assumed a value-free science of epidemiology in which knowledge, theories, techniques, and actual and potential applications are themselves devoid of self-interest or bias. As was the case in Woburn, popular epidemiology can include methodological and statistical controls for bias. Indeed, without skewing any evidence it can overcome some fundamental limitations of scientific endeavors. In practice science is limited by such factors as finances and personnel. Without popular participation it would be impossible to carry out much of the research needed to document health hazards. Science is also limited in its conceptualization of what problems are legitimate and how they should be addressed. As we have pointed out, physicians are largely untrained in environmental and occupational health matters, and even when they observe environmentally caused disease, they are unlikely to blame the disease on the environment. Similarly, epidemiologists and public health researchers are not sufficiently attuned to problems of toxic waste contamination. Funding agencies are reluctant to support the kinds of investigations needed at toxic waste sites. And, most fundamental, scientific approaches to toxic waste contamination are directed by an old paradigm that no longer fits reality. Environmental health activists are by definition acting to correct problems not adequately addressed by the corporate, political, and scientific establishments. Popular involvement is usually necessary for professionals to target the appropriate questions, as is clear from the history of the women's health movement, 20 the occupational health and safety movement, 21 and the environmental health movement. 22 These movements have significantly advanced public health and safety by pointing out otherwise unidentified problems and showing how to approach them, by organizing to abolish the conditions that give rise to them, and by educating citizens, public agencies, health care providers, officials, and institutions. Popular participation brought to the national spotlight such phenomena as DES, Agent Orange, asbestos, pesticides, unnecessary hysterectomies, abuse of sterilization, black lung disease, and brown lung disease. Indeed, those are the kinds of questions presented to public health officials, researchers, and government members in every setting where there is dispute between the perceptions of citizens and officials. Paigen offers valuable insight into the scientist's choice between type I error (being more likely to accept false positives) and type II error (being more likely to reject false positives). How Good Are Official Data? Even when citizens accept standard significance levels, they may suspect that the collection and analysis of official toxic hazard data are erroneous. Massive public complaints about Massachusetts' response to excess cancer rates in twenty communities (including Woburn) led to evaluations by the state senate and the University of Massachusetts Medical School, which found that the Massachusetts DPH studies of those excess rates were poorly conceived and methodologically weak. 35 The DPH studies were often unclear about what problem concerned the community or the DPH. Most studies had no adequate hypothesis, failed to mention potential exposure routes, and as a result rarely defined the geographic or temporal limits of the population at risk. Methods were presented inconsistently, statistical terminology was confused, case definitions were weak, and environmental data were rarely presented. Further, statistical tests were inappropriately used to explain away problems. In the case of elevated cancer in towns of Upper Cape Cod, initial analysis found no towns with excess rates. When a later analysis combined two adjacent towns, the data were compelling for the elevation of several cancer types, yet the DPH claimed that excess lung, colon, and rectal cancers had life-style rather than environmental causation. 36 Activists and sympathetic scientists find such arguments unacceptable; they view them as blaming the victims while denying possible external causes. A cardinal assumption of scientific research is that the truth and validity of science are affirmed through open access to data, yet lay inquiry into environmental health risks is often obstructed by secret scientific data and analysis. Officials sometimes withhold information on the basis that it will alarm the public, that the public does not understand risks, or that it will harm the business climate. 47 The above-mentioned University of Massachusetts evaluation of DPH studies of excess cancer rates grew out of public pressure on the legislature. Citizens were angry that the health department did not seek the input of citizens, communicate data to affected towns, or share information when asked. Local health officials reported that they typically heard of elevated cancer rates through the media rather than from the DPH. Perhaps a good deal of the governmental and professional resistance to popular epidemiology derives from the fact that lay efforts very often point to the flaws and biases in official data that we have noted. In addition, the federal government has dramatically affected the contours of environmental issues by loosening the acceptable levels of toxic hazards and regulatory agency enforcement. 53 The Reagan administration reduced controls on air and water pollution, stalled the recognition and prevention of acid rain, and reduced the regulatory power of EPA and OSHA. In December 1987 the Supreme Court limited the scope of the Clean Water Act when it ruled that citizens and environmental groups cannot sue companies for past violations. 54 Since people have long been denied access to necessary information, this decision is particularly unfair. Toxic waste, contaminated water, cancer clusters—these phrases suggest deception and irresponsibility. But more significantly, they are watchwords for a growing struggle between communities, corporations, and government. In No Safe Place, sociologists, public policy professionals, and activists will learn how residents of Woburn, Massachusetts discovered a childhood leukemia cluster and eventually sued two corporate giants. Their story gives rise to questions important to any concerned citizen: What kind of government regulatory action can control pollution? Just how effective can the recent upsurge of popular participation in science and technology be? 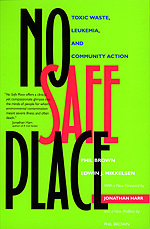 Phil Brown, a medical sociologist, and Edwin Mikkelsen, psychiatric consultant to the plaintiffs, look at the Woburn experience in light of similar cases, such as Love Canal, in order to show that toxic waste contamination reveals fundamental flaws in the corporate, governmental, and scientific spheres. The authors strike a humane, constructive note amidst chilling odds, advocating extensive lay involvement based on the Woburn model of civic action. Finally, they propose a safe policy for toxic wastes and governmental/corporate responsibility. Woburn, the authors predict, will become a code word for environmental struggles. Phil Brown is Professor of Sociology at Brown University and Lecturer in Sociology, Harvard Medical School Department of Psychiatry. Edwin J. Mikkelsen is Director of the Division of Child Psychiatry at the Massachusetts Mental Health Center and Associate Professor, Harvard Medical School Department of Psychiatry.